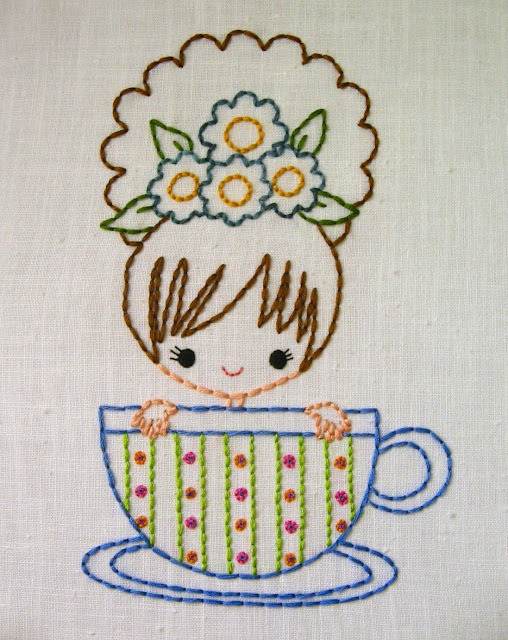 Stitchy Stitcherson: Greenbeanbaby Embroidery Patterns!!! If you followed the links in my last post, you probably already figured out that the incredibly talented Ellia of greenbeanbaby is turning her adorable designs into embroidery patterns. I have been a longtime fan of Ellia's work. I have several pieces of her lovely artwork in my home, as well as Christmas ornaments, fridge magnets, and more! You also may recall this post from a few years ago, where I revealed a piece I'd stitched based on a free cut-paper pattern Ellia offered. That piece confirmed what I had suspected: Ellia's work would make great embroidery patterns. So, when Ellia asked me to sample some patterns for her to see if they'd work for embroidery, I jumped at the chance! And now her fabulous patterns are on sale in her Etsy shop. Check them out, tell your friends, and visit often, for there are more patterns in the works! I think I'm going to have to buy some patterns soon! I just ordered the sugar skull girl! So adorable! oh, my!!! How cute are those?? Thanks for posting! Ack! The mermaid and genie are way too adorable!! Great job on these. What adorable patterns! And very cutely stitched up =). Adding greenbeanbaby's link to my Embroidery Patterns bookmarks!! Too much cute and sweetness!!!! Lucky you getting to test the patterns too!